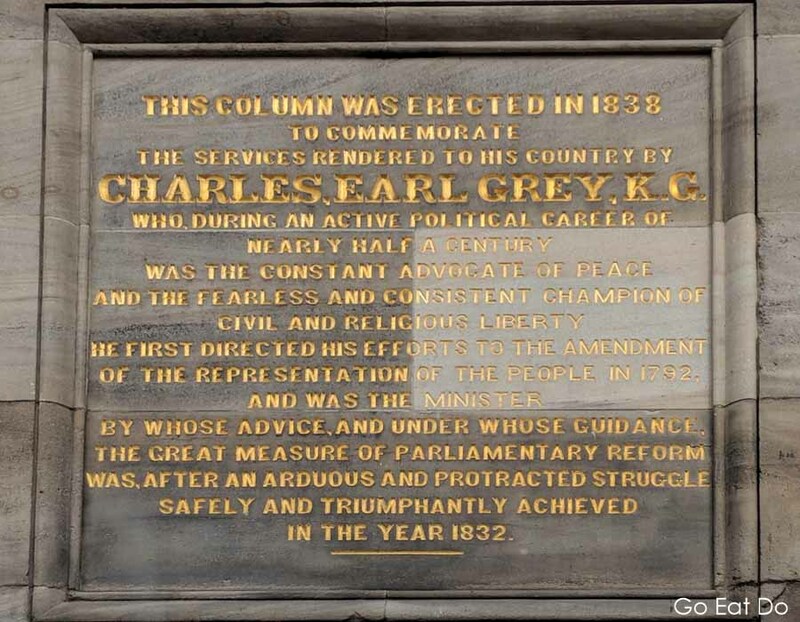 Grey’s Monument, in central Newcastle, stands in memory of the man for whom bergamot-infused Earl Grey tea first was blended. From April to September this most English of landmarks opens on the first Saturday of the month for visits by members of the public. Disclosure: Some of the links below, marked with a (£), are affiliate links, meaning, at no additional cost to you, I will earn a commission if you click through and make a purchase. Known locally simply as the Monument, Grey’s Monument looks very similar to Nelson’s Column, which stands at Trafalgar Square in London. The statues at the tops of both were sculpted by Edward Hodges Baily. Newcastle’s answer to Nelson’s Column? Grey’s Monument in central Newcastle-upon-Tyne, England. A lightning strike, during the summer of 1941, knocked the head off Grey’s Monument. As I waited to squeeze through the tiny door leading to the spiral staircase within the column, one of the Newcastle City Guides checking visitors’ tickets at the base of the landmark recounted an anecdote about that event. Apparently, a local shop owner retrieved what was left of the head and placed it his window, along with a sign telling people that his prices were so good that even Earl Grey had come down for a closer look. In case you’re wondering, the head has been replaced. Ralph Hedley, a local sculptor, crafted the replacement that was placed atop the monument in 1948. A blue sky above Grey’s Monument in Newcastle. The Monument Metro station is below the city landmark. He first directed his efforts to the amendment of the representation of the people in 1792 and was the minister by whose advice, and under whose guidance, the great measure of parliamentary reform was, after an arduous and protracted struggle safely and triumphantly achieved in the year 1832. Grey, whose family home was Howick Hall in Northumberland, was the Prime Minister of the United Kingdom between 1830 and 1834. The Great Reform Act, officially the Representation of the People Act of 1832, extended the country’s voting franchise, created new parliamentary seats and abolished so-called ‘rotten boroughs’. A picture can be worth 1,000 words. Actually, it’s 95 in the case. The inscription on Grey’s Monument. The best view of Newcastle? It was, though, the prospect of panoramic views over Newcastle, rather than Grey’s political achievements, that had me wanting to climb the 164 steps leading to the narrow viewing platform at the top of the city landmark. Ideally, I’d have climbed Grey’s Monument on a bright day and clipped a series of appealing photos of Newcastle’s skyline. Unfortunately, the April sky was overcast and grey during my visit. Recent rainfall and springtime snow meant that water was still being pumped from the base of the Monument when I arrived for my allotted 10.00-10.30am timeslot. Those of us wishing to climb the spiral staircase to the top had to plodge through about a centimetre of residual water. The view Lord Grey has from the top of Grey’s Monument. Climbing the staircase within Grey’s Monument resulted in the revelatory realisation that the column is perforated by a series of narrow vertical and horizontal slits. Like arrow slits in a medieval castle they provide a view below and light to stream in. Despite passing the Monument hundreds of times, I’d never noticed the slits previously. One of the slits in Grey’s Monument. Thankfully the railing on the viewing platform is high, otherwise I’d have felt very shaky while looking down over the city. Over the course of a few minutes I rotated around the column and admired the view, carefully stepping over the lightning conductor while doing so. What did I do after climbing Grey’s Monument? Head for a cup of tea, a cup of Earl Grey, of course. Buildings in central Newcastle, seen from the viewing platform on Grey’s Monument. 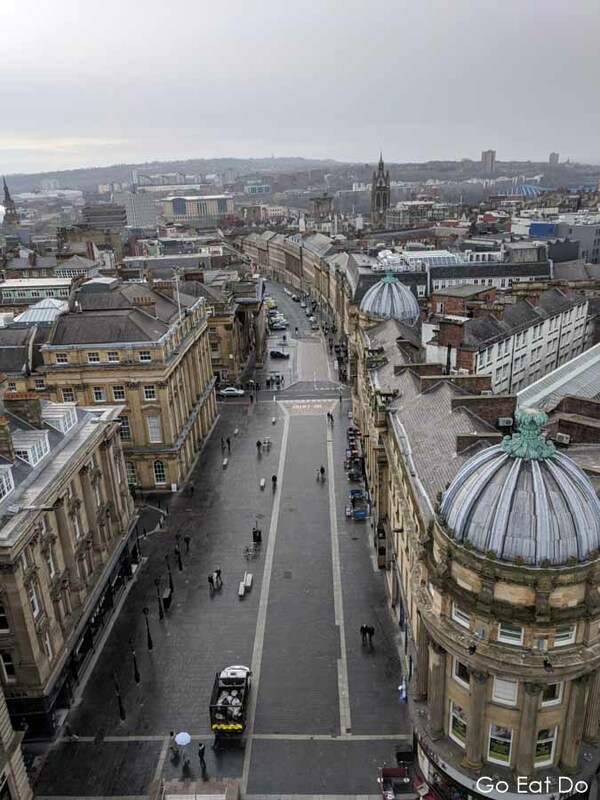 See the Newcastle City Guides website for information on how to book a ticket to climb to the top of Grey’s Monument and guided walking tours on Tyneside. The NewcastleGateshead website has information about attractions in both Newcastle and Gateshead. From 22 June until 9 September 2018 Tyneside will be hosting the Great Exhibition of the North. The Visit England and Visit Britain websites have ideas about things to do and places to visit in Tyne and Wear and beyond. The lower four of the photos illustrating this post were photographed with a Google Pixel smartphone. Stuart Forster, the author of this post, can be commissioned to write food and travel features about the north-east of England and beyond. You know, I lived in the North East of England for 16 years and never done this. I really need to start exploring my own doorstep! Opportunities for 2018 sold out quickly, I learnt after posting this story. Keep your eyes peeled and hopefully you’ll get to climb the Monument soon. Newcastle really a wonderful place to visit. All of these pictures inspire us. It’s a historical place, and every traveler wants to see another look of Newcastle. I am a traveler and love to visit those historical places. Now I excited to visit Newcastle. Thanks for sharing this.